Check out our site, if you haven't already, and enjoy this article about my thoughts following last Sunday's thrilling game! As I write this on my return journey home from frigid Minnesota, I'm still processing what we all saw this past Super Bowl Sunday, one in which my Patriots surprisingly fell short to a hungry, well-prepared Eagles team that captured its first NFL championship in over a half-century. But I can definitely come to this conclusion: Super Bowl LII was a spectacular event. From the compelling pregame storyline -- the NFL's greatest dynasty taking on an upstart team led by a backup quarterback -- to the terrific atmosphere at the sleek, impressive US Bank Stadium, and finally to the game itself, one of the more entertaining and explosive playoff games ever, Super Bowl LII undoubtedly exceeded expectations and will certainly be remembered as one of the ten, and perhaps even five, most memorable Super Bowl's of all-time. Of course, I'm still disappointed that Sunday did not end similarly to two of the past three seasons, with me -- a diehard Pats fan -- either jumping ecstatically in a South London pub after last year's unbelievable comeback and belting out "We Are The Champions" 'til the break of dawn, or practically crying tears of joy alongside my dad in the upper deck of University of Phoenix Stadium following Malcolm Butler's game-ending interception after all hope seemed to be lost. Those are the breaks, though. For every Butler interception or Julian Edelman circus catch, there is a David Tyree miracle or a Brandon Graham strip-sack that abruptly delivers an unwanted dose of reality. It's easier to come to grips with these relatively painful moments, however, knowing that most NFL fanbases are happy to see the occasional home playoff game, let alone experience what it is like to watch their team play in -- and win -- multiple Super Bowl's. I've also had the realization that for every ardent Patriots fan like me, there is another similarly passionate supporter of a team like Philadelphia, some of whom, as my dad pointed out as we commiserated in the airport a few hours after the Eagles' confetti celebration, have waited upwards of 50 years for this moment. And as a younger, jubilant Philly fan, who was not too much older than I was when I first watched my team win the Super Bowl in person, remarked to my dad and I during the game's waning moments, "You guys got five...we still don't know what it's like to even win one." Well, now that kid, along with the tens of thousands of other passionate and surprisingly respectful Eagles fans who far outnumbered members of Patriot nation in Minneapolis know the feeling. 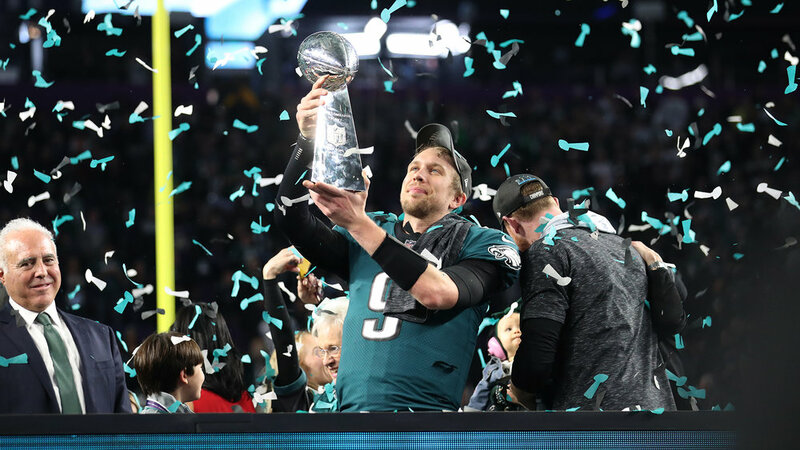 And what a run it was for Philadelphia, who embraced the underdog role with open arms en route to beating both of last year's Super Bowl participants over a one-month stretch that was nothing short of remarkable considering Carson Wentz's season-ending injury. Credit Nick Foles for building on his sensational performance against Minnesota's top-ranked defense in the NFC Championship. I didn't think it was possible for him to play that well again. But he did, as he torched Bill Belichick's defense like no other quarterback has against New England in a meaningful game. He was poised and precise throughout, showing unbelievable accuracy on many throws, like his two touchdown passes to Alshon Jeffrey and Corey Clement. More importantly, he was resilient in leading Philadelphia back from its first deficit late in the fourth quarter. But the pivotal roles played by the Eagles' offensive line and head coach Doug Pederson in the victory also can not be emphasized enough. Philly's line was easily the best unit on the field and deserving of what I'll call the "Unsung Hero" award of Super Bowl LII. Led by All-Pro's Jason Kelce and Lane Johnson, this group proved it was the best line in football by rising to the occasion on Sunday, paving the way for LeGarrette Blount and Jay Ajayi to rush for 6.4 yards per carry while also not allowing a single sack in pass protection. As for Pederson, he joins a short list of men who significantly out-coached the most accomplished head coach in NFL history. His brilliant offensive game plan made the Patriots' defense look helpless in trying to prevent Foles from continuously finding open receivers throughout the contest. The analytically-driven Pederson also proved that the Super Bowl is no time to get conservative: the Eagles converted on two crucial fourth down opportunities -- the first of which (the Foles receiving touchdown) will go down as one of the more memorable plays in recent Super Bowl history; the second (a fourth-and-one on Philadelphia's penultimate drive) set up the Eagles' go-ahead touchdown. Many other inferior coaches undoubtedly would have played these situations more conservatively. It's at least comforting to know that this loss did absolutely nothing to diminish Tom Brady's legacy. Ironically, the Patriots somehow lost despite Brady putting together his finest Super Bowl performance. Sure, the potential game-winning drive did not turn out as planned, but whereas in past appearances Brady has performed superbly almost exclusively in the fourth quarter after making big mistakes early in the contest (i.e. the pick-six in last year's game; two interceptions against Seattle in XLIX), the ageless wonder was superb throughout, throwing for a Super Bowl record 505 yards (!) while leading the Patriots to a ridiculously-high average of 8.5 yards per play (the Eagles, for the record, averaged 7.6; but simply averaging over 6.0 yards per play is considered excellent). All this success came against a Philadelphia defense that ranked in the top five of defensive efficiency and had allowed just 17 points in its two previous postseason games, too. It will not be a pleasant offseason, however, for Bill Belichick and many members of the Patriots' atrocious defense. Not that this loss does much to negatively effect Belichick's legacy, but it should prompt plenty of reflection. At the very least, changes are almost certainly abound for this unit, starting with Super Bowl XLIX hero Malcolm Butler, who was questionably benched on Sunday with little explanation. Nonetheless, not even before leaving en masse to encounter a dark and still frigid Minneapolis night with the rest of the Patriots fans, who had little interest in watching another team's Lombardi celebration, Vegas oddsmakers had already installed New England as the early favorites to win Super Bowl LIII in Atlanta. ESPN followed suite by ranking the Patriots first in their "Way Too Early Power Rankings" as well. While I actually disagree with both Vegas and ESPN's judgement (how can the Eagles not be the favorites, especially with Wentz returning?) it is an indication that good times will continue to roll in Foxboro. Yet as one incomparable dynasty trends past maturity and toward its eventual descent, another may be forming in Philadelphia, making the possibility of another unforgettable encounter next February all the more intriguing. Hopefully that hypothetical rematch ends differently than Super Bowl LII. But as a fan of both the Patriots and the event, I'll sign for any experience as sensational.